THAT MAN IS YOU! 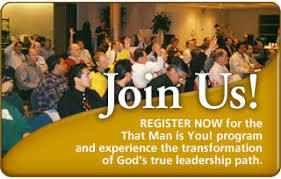 is an interactive men’s program focused on the development of male leadership in the modern world. It combines the best research from science with the teachings of the Catholic faith and the wisdom of the saints to develop the vision of authentic men capable of transforming themselves, their families and greater society. The Vision of Man Fully Alive enables men to experience authentic freedom as sons of God. Through living the three-fold mission of abiding presence, joyful service and loving sacrifice, their hearts and homes will experience the joy that God desires. To sustain them on their spiritual journey, the men will be led directly to the three spiritual foods that Christ himself proclaims: The Eucharist, The Word of God, and The Will of God. THAT MAN IS YOU! is a program for all men-- NO EXCEPTIONS! Plan to be a part of this great series. This fall semester begins September 6th. The men meet for breakfast in the OBORNY AUDITORIUM at 6:00 a.m. This is followed by a presentation of a speaker for about 30 minutes and finally followed by a period of discussion ending at 7:30 sharp. (Some who need to leave for work do leave earlier). A description of this year's program is shown below. It is open to all. It is intimately related to the family. Come once to experience a session.